Together with the refrigerator, the washing machine is the commonest domestic appliance to be found in households the world over. The history of the washing machine goes back to the earliest civilizations, as people tried to find the best ways to wash their clothes, first in streams of running water and then in ever more sophisticated wash-houses and tanks. The washing machine meets a basic need: to wash clothes and household linen. And it is this daily necessity, with the associated desire to render the washing process less laborious and more hygienic, which has brought about the impressive array of inventions with which we are familiar nowadays. Washing linen by hand is one of the most laborious household chores that exists. Washerwomen used to wash linen with soap by the edge of a stream or river, or else in a fountain or a wash-house. They rubbed the cloth on stones or wooden planks, adding sand if necessary, so as to remove stains and encrusted dirt. Then they would twist it, before hitting it with a wooden beater, to remove as much water as possible. Over the years, washerwomen improved their techniques by using a variety of natural detergents. The Gauls used birch cinders for better cleaning of material, a process which dates back to 2800 years B.C. The cinders used in the earliest washing powders were replaced much later on by soda crystals. The Romans, on the other hand, built public laundries (fullonicae in Latin, i.e. fulling mills). Fuller’s grass, imported from Syria, being too expensive, the Romans used fermented human urine to bleach linen, with its high concentration of ammonia. The urine was poured into a tank and the fuller (or fuller woman) took care of fulling the cloth: treading on the sheets and clothes to clean them. The emperor Vespasian is still famous today for having imposed a tax on urine collection. When his son, Titus, complained to him about this, Vespasian shoved the first receipts from this tax under Titus’ nose and asked him whether they smelt bad. Titus replied that they did not and from this conversation was born the proverb Pecunia non olet : “money has no smell”. Centuries later, the earliest public toilets were named Vespasians. And as late as 1909, at Elbeuf (76), human urine was still being collected for spinning the wool for army bedsheets. Amongst the working professions which arose during the nineteenth century, you could also find washers, laundrywomen, pressers and even bleachers. These women were employed in laundries or else worked on their own account. Before the arrival of wash-houses and other areas set aside for washing, villagers had to draw dirty water which was a source of infection. The proliferation of wash-houses played a major role in terms of public health and hygiene, at a time when cholera, smallpox and typhoid fever used to ravage populations. State subsidies partly financed the construction of public wash-houses and governments pronouncements were made, even then, regarding the basic principles of hygiene. Wash-houses were covered areas laid out to facilitate the work of laundrywomen. Such establishments were even a sign of wealth and it was possible to judge the level of prosperity of a village by the number of public wash-houses. Wash-houses also played an important social role: women from all over the village met there at least once a week (except for very senior ones) and would exchange local news. The wash-house became a “talking house” and it was not unusual to hear the women singing, as a means of lightening their daily chores and passing the time. Wash-houses gradually disappeared as running water was introduced into homes. 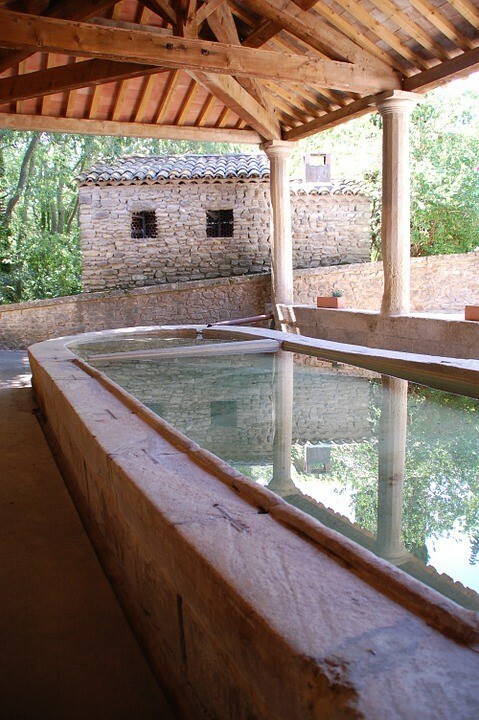 As for the washerwomen’s techniques, these inspired the earliest prototype washing machines. 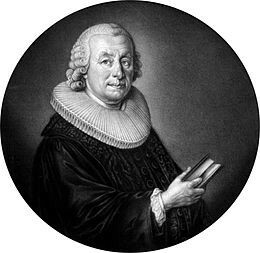 We owe the invention of the washing machine to Jacob Christian Schäffer (1767). 30 years later, an American, Nathaniel Briggs, obtained the first patent for a washing machine. It involved pouring hot water into a tank, turning a lever to wash the clothes and then wringing them between two rollers. The tank was then drained using a tap. 210 years further on, the electric washing machine was invented. In 1905, the first drum washing machines appeared. They were still hand-operated but the steel tank allowed for a coal burner to be included. Towards 1920, the first electric machines were born: only the turning mechanism was electric. The remaining controls were still manual. In 1990, a British inventor, James Dyson, produced a washing machine with two cylinders which turned in opposite directions, thus reducing washing times and giving better results. Nowadays, washing machines are connected to the internet and may have integrated Wi-Fi for deferred startup of washing programs, for instance during off-peak times when electricity costs are at their lowest. Some models work without detergent, thanks to electrolysis, which separates the positive and negative ions. Some machines will soon be equipped with touch screens, following the example of the models presented by American leader in the field, Speed Queen. Until the 18th century, washing was done at the municipal washhouse with the help of a beater and a brush, a little soap and some ashes. In many cases, you had to go to the next village to wash laundry occasionally. Washing was a challenging task and a luxury. But this would change thanks to the initiative of a few outstanding inventors and entrepreneurs. A look back at the incredible journey of an appliance which is now part of our daily lives. A German, Jacob Christian Schäffer, invented the washing machine. This scientist was a Jack-of-all-trades. Holder of degrees in philosophy and theology, member of many learned societies, including the Academy of Science in Paris, Jacob Christian Schäffer prepared a botany manual for pharmacists and physicians, designed a new ornithological classification methods and carried out important work in mycology, and entomology as well as experiments involving optics and electricity. In 1786, Goethe personally visited this great scholar’s curiosity cabinet. On 31 March of this year, an American, Nathaniel Briggs, filed the first patent for a washing machine. The very first mechanical washing machines appeared in England. An American, John E. Turnbul, invented the roller washing machine. James King filed a patent for the first drum machine. This model, however, was still mechanical and the engine was activated with a crank. All the same, physical exertion was reduced. A machine by James King, included a wringer, thereby facilitating washing. Frenchman François Proust created a prototype, more hygienic, double boiler: the steam sterilized the linen. But not all materials could stand such treatment. French manufacturer Flandria launched the “Barboteuse. Thanks to these manual washing machines, household linen could be washed at home, in much more comfortable conditions than were available in the laundries. An American engineer, Alva John Fisher, is generally considered to be the inventor of the first electric machine. But at least one patent was filed before his, for a model electric machine. However, the identity of the inventor remains unknown to this day. Wooden tanks were replaced by metal ones. The Hurley Electric Laundry Equipment Company launched “Thor”, the first electric washing machine to go on the market using the Alva J. Fisher prototype (patented in 1910): the drum was powered by an electric motor. On the early models, this engine was not watertight and short-circuits occurred frequently: the machine was therefore potentially dangerous. In addition, the machine did not wring out the linen. 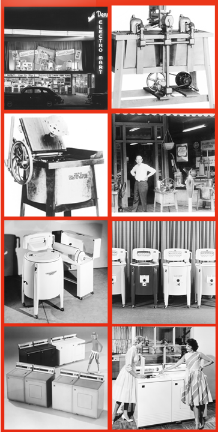 Joe Barlow and John Seeling founded Barlow & Seeling Manufacturing, later Speed Queen, today world leader in industrial laundry and laundromats, recognized for the amazing durability of its professional washing machines. Barlow & Seeling Manufacturing improved the electric washing machine, making it safer and more efficient, and then began selling its own model. 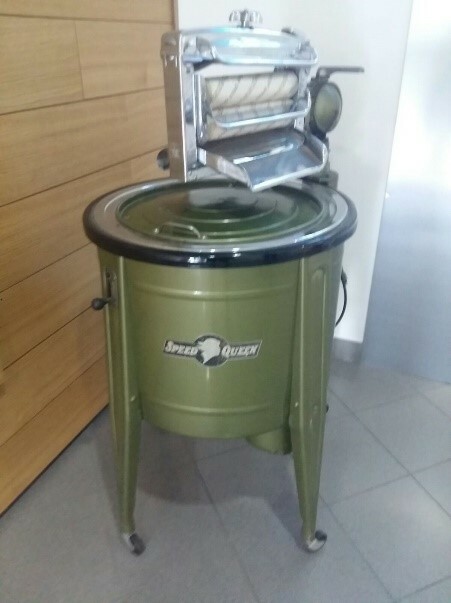 Speed Queen introduced on the market the first multidirectional wringer. Electric motors became waterproof and two-speed: slow for washing, faster for spinning. Put on show at the Paris Fair, this washing machine excited strong interest. 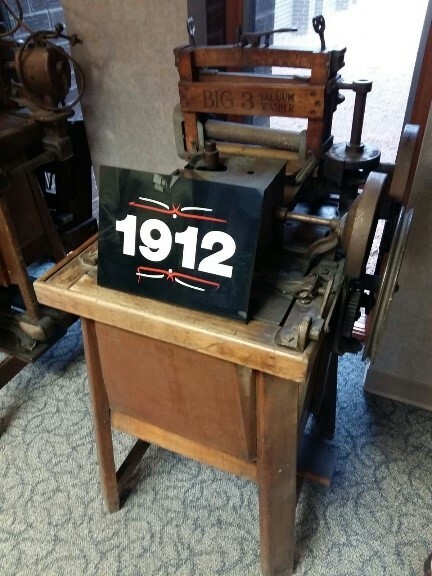 The first machine with spin function incorporated was born. Sales of electric washing machines soon reached 913000 units in the United States. The first washing machines went on the French market: they had the spin function incorporated. Working for the Bendix Aviation Corporation, American John Chamberlain invented a multifunctional machine which could wash, rinse and spin in a single cycle. A patent was filed the same year for this model, which is considered the first automatic washing machine. Of the 25000 000 US homes connected to the electricity grid, 60% had an electric washing machine and most of these households also had an electric wringer. To support the war effort, Speed Queen interrupted production of professional washing machines. The USA did, however, allow manufacturers to continue their research and development activities on machine automation. A pressure switch and a solenoid valve cut off the water supply when the tank has filled up. A timer controls the operating time. But automatic washing machines, still an innovation in the early 50s, were expensive and, to begin with, were mostly restricted to laundromats. Very few households were able to afford them. Laundromats grew in number across all major US and European cities during the 50s and 60s. Models continued to improve, integrating centrifugal force to wring the laundry and incorporating programed washing cycles (a washing program for each type of laundry; the wool cycle only arrived in 1997). Different brands of washing machine began advertising their products. In 1967, 44% of French households had a washing machine. 10 years later, 74% of French households had one. From the 80s onwards, machines contained miniaturized, electronic components (microprocessors, RAM …) and consumed less and less water and electricity, in an attempt to conserve the environment. Nowadays washing machines offer dozens of wash cycles and water levels, programmable before or during washing. 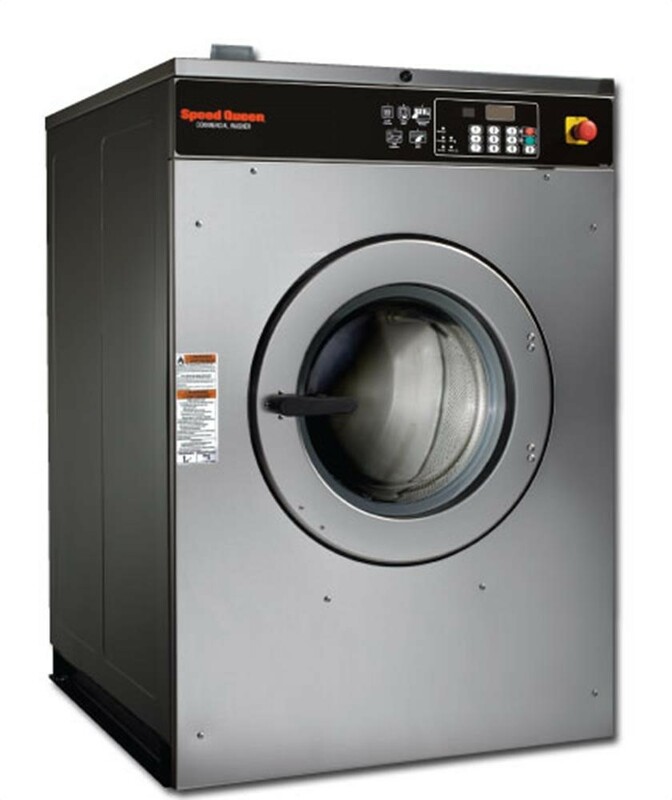 Speed Queen professional washing machines – for industrial laundries (hotels, hospitals, communal residences …) and laundromats – are at the forefront in terms of performance. These machines reduce daily consumption of water and energy, preserve the qualities of the laundry which they wash in record time thanks to G force spin speed.